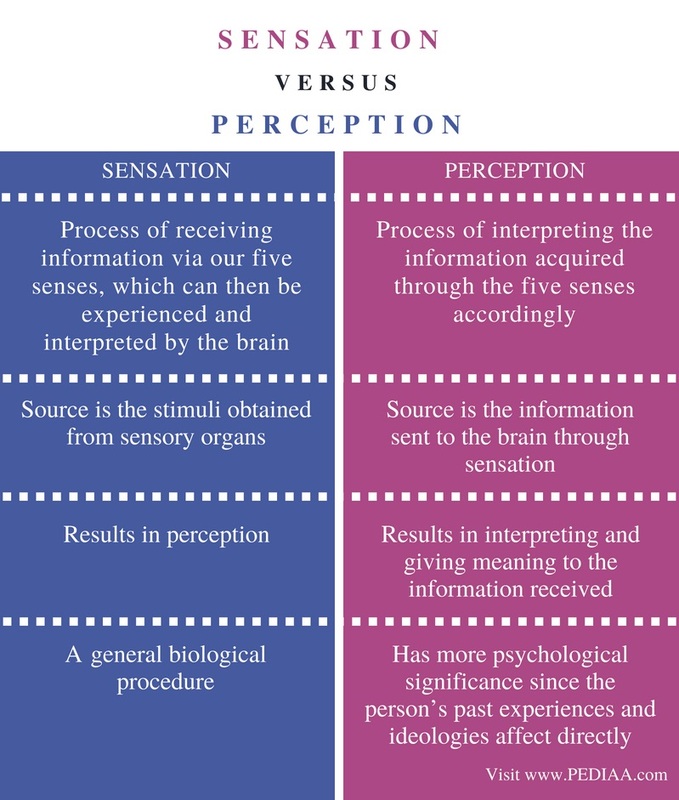 The main difference between sensation and perception is that sensation is the process of sensing our surrounding using the five senses while perception is the process of interpreting the acquired sensations. Sensing and perception are fundamental psychological processes of how we acquire information. 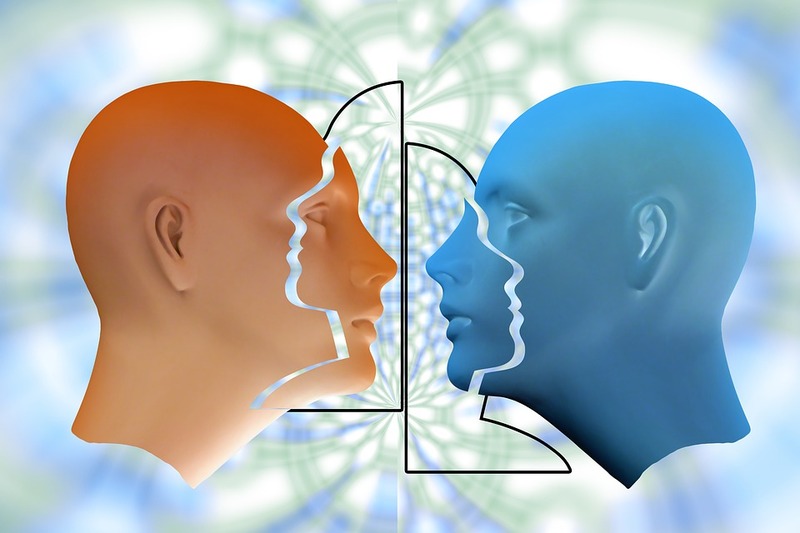 Both these are related to one another with relation to one’s thoughts, opinions, and decisions throughout that person’s life. Hence, even though they are two very different processes, they occur in relation to one another. As a result of the stimuli we receive through these sensory organs from our environment, our sensory receptors get stimulated and send this information to our brain. Thus, this process is known as sensation. Therefore, in sensation, only the physical stimulus, together with its physical properties, are registered by sensory organs. Hence, there is more of a biological or a physical attribute to the process of sensation, making it common to everyone. Moreover, there are several types of sensory loss that occur due to a dysfunctional sensation process, as a result of ineffective receptors, nerve damage, or cerebral impairment. This makes the sensation process to not to function properly, or not to obtain correct stimuli from the sensory organs. How does the nervous system work with other systems? Perception is the process where our brain performs the organization of information it obtains from the neural impulses and then begins translation and interpretation of them. 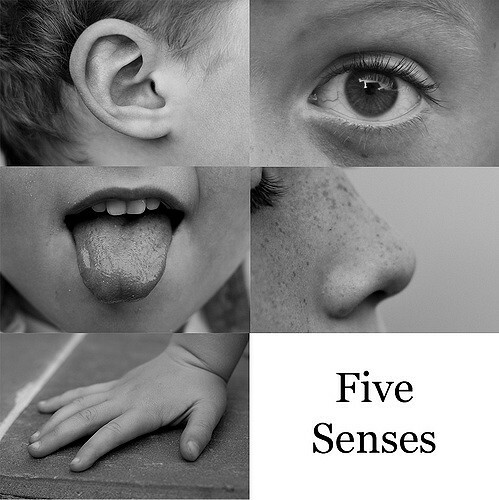 In other words, after our five senses receive several stimuli that are sent to our brain as nerve impulses, our brain interprets those impulses as a visual image, a sound, taste, odour, touch, or pain. Since the interpretation of this sense happens as a result of one’s experiences, unlike sensation, the result of perception differs according to each individual. Recipient’s experiences, learning, memory, expectation, and attention can also shape perception. Therefore, perception is the indication of how and what a person thinks about his or her surrounding, and as a result of how he or she understands and looks at the world. Moreover, perception involves both bottom-up and top-down processing. It involves bottom-up processing since perceptions are built from our sensory input. On the other hand, it also involves a top-down method since our available knowledge and experience influence how we interpret those sensations. Sensation is the process of receiving information via our five senses, which can then be experienced and interpreted by the brain. Perception is the process of interpreting the information acquired through the five senses accordingly. The source of sensation is the stimuli obtained from sensory organs whereas the source of perception is the information sent to the brain through sensation. Sensation results in perception, which results in interpreting and giving meaning to the information received. Whereas sensation is a general biological procedure, perception has more psychological significance since the person’s past experiences and ideologies affect directly. Sensation and perception are basic phenomena in us that happen throughout our life. Sensation basically refers to the process of sensing our environment using the stimuli we obtain from our five senses, on the other hand, perception refers to the process of interpreting those stimuli to meaningful information. Thus, perception typically follows sensation. This is the basic difference between sensation and perception. 1. “Sensation (Psychology).” Wikipedia, Wikimedia Foundation, 27 July 2018, Available here. 2. “Introduction to Psychology.” Lumen, Open SUNY Textbooks, Available here. 3. “Perception.” Wikipedia, Wikimedia Foundation, 10 Aug. 2018, Available here.